Apple and Google have all but destroyed the competition in the smartphone space, with the two companies' flagship mobile operating systems —iOS and Android —combining to power 96.3 percent of the smartphones shipped in 2014, new data indicates. Apple took 14.8 percent of the market —a slight year-over-year drop —compared to 81.5 percent for Google, according to market research firm IDC. 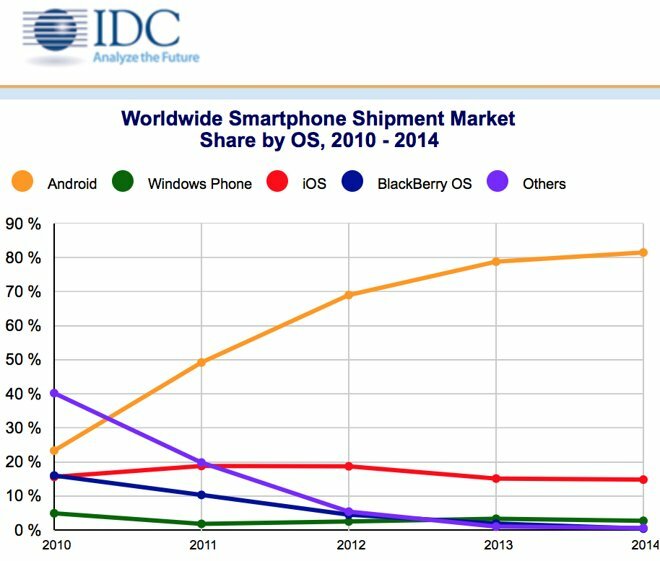 Formerly dominant players Microsoft and BlackBerry accounted for just 2.7 percent and 0.4 percent of shipments last year, respectively. "Many of the same drivers were in play for Android and iOS to tighten their grip on the market," IDC research manager Ramon Llamas said in a release. "A combination of strong end-user demand, refreshed product portfolios, and the availability of low-cost devices - particularly for Android - drove volumes higher." Android's share of the overall market has long been buoyed by hundreds of millions of low-spec devices sold in emerging markets that can be had for as little as $50. Apple's iPhone 4s, currently the oldest and cheapest iPhone the company sells through its own distribution network, comes in at more than $300 without subsidies. This discrepancy has allowed Apple to turn the tables when it comes to profit share. Despite owning less than one quarter of the overall market, Apple rakes in nearly 90 percent of the industry's profits.